Almost every mom complains at least a little bit about getting their kids to eat enough vegetables. Most kids would rather have fruit, and it can be hard to convince them to eat more of this all important food group. Juice is an ideal way to sneak in a few greens and other vegetables into your child’s diet, and they won’t even know you did it. 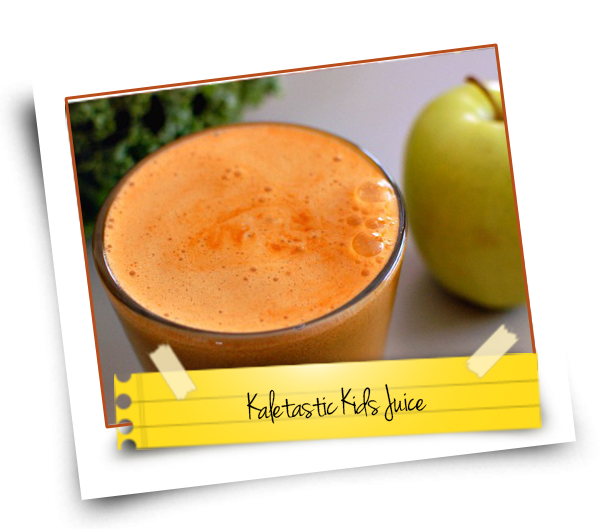 This juice is great for growing bodies, rich in vitamin C, A, K, and antioxidants, it is full of the greens you cannot get your child to eat any other way. Still sweet thanks to the carrots, and apples, your kids will never know they are eating something good for them. They will only know how good it tastes. Wash ingredients. Peel the cucumber and orange. Cut up ingredients to a size that will easily feed into juicer. Start your juicer on the lowest speed and slowly feed the greens into it. These tend not to juice as easily as the fruits, so starting them out in a clean juicer on low, can help them to juice as thoroughly as possible. Turn the juicer up on high and feed in the cucumber, carrots, apple, and orange. Either serve right away, or chill and serve later. Tip: If this juice is too strong, substitute kale for a milder green, such as lettuce. You can also water juices down to help your child get used to the taste. Add an extra apple the first time you make this for your child. This will make it a lot sweeter, and give it a more familiar taste they are used to. Substitute pears for apples, they are much sweeter and most kids love the taste of pears. Toss a few blueberries or any other berries in with the rest of the ingredients, not only will it hide the green color of the kale and spinach, but blueberries are high in antioxidants.